I believe that eventually phones are going to have 3D depth sensors in them (probably in 2 or 3 years), and I think this can dramatically improve what we will be able to do in VR on the go. I mean look at Google's project Tango, that is already a phone with a depth sensor https://www.google.com/atap/projecttango/#project. 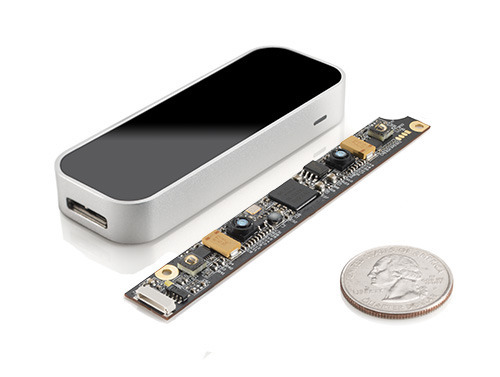 And even the Leap motion device is quite small (not that small because it doesn't need to be, since its a desktop device) but only costs $70, now imagine that in 2-3 years, the price will be so small that there won't be a reason not to put it into the phone. This would bring hand tracking (once the phones are a bit more powerful) for VR experiences and that would make it far more immerse. It would also open the window to Augmented reality games and apps. There is so much new things you could do with this, just comment your ideas and opinions below I would love to hear (well technically see, but hear sounds better) them. ... there won't be a reason not to put it into the phone. This would bring hand tracking (once the phones are a bit more powerful) for VR experiences and that would make it far more immerse. Just look at Tango - Google is already doing it. But when you look into VR it might take longer in the mobile sector because those devices need computation and power, so it will eat away resources that are already very much in demand when going VR on a mobile device. I do not expect that mobile VR will see hand tracking any time soon - first they will want to solve the positional tracking and evaluate how it impacts power consumption and thermal I guess. But it would be cool - having hand tracking for menu controls would be great asset for game design.